From faculty members with startup companies to graduate student work that has the potential to change the way we live and learn, ECE researchers are affecting change in the world beyond the university campus. 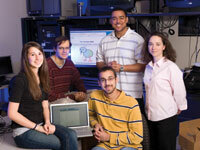 In the process, ECE has become a hub for entrepreneurial endeavors at all levels. Doctoral student Chad Aeschliman is in the driver’s seat when it comes to research, literally. The catch is that he has taken his hands off the wheel. Aeschliman, working with Professor Ray DeCarlo, has developed automated-steering technology that has the potential to make car travel safer. Already installed on a test vehicle, the technology, based on lane-center tracking, so far has a 95 percent efficiency rate on the highway and has heavy potential to be marketed to automakers worldwide. The hands-free technology consists of a windshield-mounted camera, focused on the usual driver’s viewing plane, which records 30 frames per second. Images are sent to a 600 MHz processor in the dashboard that identifies the painted, dashed, and solid driving lane boundaries, and signals a motor that turns the steering wheel so that the car effectively tracks the center of its driving lane without any human interaction. Before you start planning that hands-free, pre-programmed ride to the supermarket, Aeschliman’s focus is not convenience but safety. As an example, with automated steering, if a driver were to fall asleep at the wheel, the device would recognize that the car had moved dangerously close to either of the driving lane boundaries and audibly alert the driver while steering the car back to the center of the driving lane. With self-steering technology already on the radar of major automakers, Aeschliman’s project comes with the added bonus of being inexpensive. With a mere 1,200 lines of code, the basic self-steering device costs $200, and much less if mass produced. More featured, more efficient, and slightly more expensive models would still seem a small price to pay for increased safety, effectively leveling the playing field for low-end, smaller cars traveling the same roads as the often larger and more expensive cars and SUVs. This revolutionary technology, born of Aeschliman’s own boredom with his two-hour commute between campus and home, combines his passion for building things with his research interests. As his advisor, De Carlo is excited about the project, particularly about seeing theory and practice merge with nearly unlimited potential for future development. So the next time you see someone driving with no hands, don’t panic, it might just be the car of the future. Students in Mimi Boutin’s classes are developing an interactive online learning tool that is changing the way information is stored and shared. “Kiwi,” a play on its converse, Wikipedia, is an online space where class notes, discussions, and images help students connect and learn together. Inspired by a desire to increase communication and based on the principle that teaching others is itself a learning tool, Kiwi has the potential to revolutionize how we communicate and, more importantly, how we learn. Since Kiwi is student driven, Boutin stresses that just as in research where there is no absolute truth, in the Kiwi environment there is no authoritative voice to guide—or limit—what the students discuss. What they have found is that this bottom-up interface allows for knowledge and information to be shared, with the idea that creating a community of ideas will give students, themselves burgeoning researchers, the tools to explore for themselves. Innovations like Kiwi have the potential to change the way students interact with their professors, fellow students, and information itself. With a pool of knowledge at their fingertips that is at once deep and holistic, students can choose what to use and what to discard. The tool gives them the ability to filter what is useful and extract what they need. Still in its relative infancy, Boutin and her students envision Kiwi as a model that could be used not only by schools and programs university wide, but could easily be applied to industry and other environments where maintaining and sharing large amounts of information is necessary. As a multi-dimensional learning tool of data, links, and graphs, Kiwi demonstrates the non-linear nature of how information is used and how it can be shared. As the Kiwi environment grows, and with the potential to be used campuswide and beyond, ECE students are quietly transforming how learning happens. 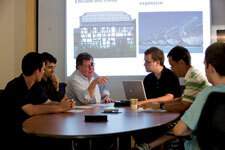 Distinguished ECE professor Jerry Woodall knows a bit about entrepreneurship. As the founder or co-founder of five companies to date, his ideas about the university’s role in entrepreneurial endeavors can help us understand both the challenges and vast potential that seemingly small ideas can have on the marketplace. For Woodall, entrepreneurship activities within the university environment, while holding great potential for commercialization, also face significant hurdles in terms of obtaining funding and winning support. Woodall says that entrepreneurship is exciting at an institution like Purdue because it allows researchers to step outside the lab and take their research to another level—commercialization. Each of Woodall’s own companies has sought to address technological issues by marrying research with market needs. His first company, Mellwood Labs, Inc., began in 1995, followed by OptoLynx, LLC, LightSpin Technologies, LLC, Compound Photonics, Ltd, and AlGalCo, LLC. The latter is capitalizing on Woodall’s research in producing hydrogen on demand from water using aluminum and gallium catalysts. The research, already receiving significant attention, has great marketing potential in the medical device field and in aiding developing countries in producing clean drinking water. Especially exciting is the application of Woodall’s research in creating hydrogen hybrid automobiles, hydrogen enriched diesel fuel for cleaner and more energy efficient trains, and environmentally sound and secure electricity by enabling wind and solar power. A successful entrepreneur must have personality and drive along with the ability to successfully fund and run a business operation. While becoming profitable is always a goal, Woodall says: “the diffusion of new knowledge should be the key drive behind any entrepreneurial activities.” The reward is seeing an idea blossom into something useful and with commercial value. With the economy becoming more globally focused, the potential for marketing ideas seems infinite. A number of programs in place at Purdue are making becoming an entrepreneur attainable for students and faculty alike. One example Woodall points to is the certificate program at the Burton D. Morgan Center for Entrepreneurship, housed in the university’s Discovery Park. He says students in this program are most interested in learning the process of entrepreneurship and in getting out on their own. While opportunities abound at Purdue, the challenges inherent in entrepreneurship at any university have the potential to become obstacles and to actually slow the process of commercialization. Funding can be a significant obstacle to entrepreneurial endeavors. Companies are more interested in supporting the final product than in sponsoring research, which may or may not become profitable in the long run. In addition to funding woes, issues over intellectual property (IP) can stifle creativity and profitability, says Woodall. Stemming from the Bayh-Dole Act of 1980, universities with entrepreneurial pursuits own the IP resulting from government-funded research. “As a result, it is difficult to obtain funding from large companies,” Woodall says. “Universities are hard-pressed to show a commercial gain from marketing their IP.” A more productive route, according to Woodall, would be educating and training students via classroom and research activities, then diffusing this knowledge into society so that startup companies can commercialize it; a win-win for researchers, students, and society.